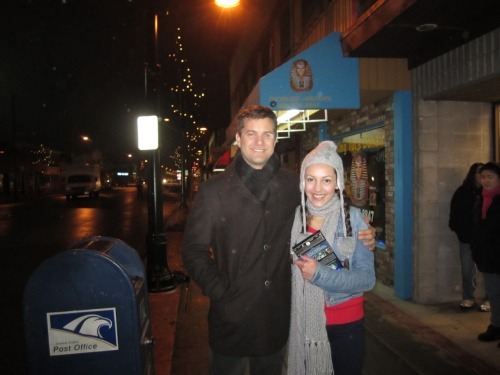 Hanging in #Whistler with Joshua Jackson in the Dubh Linn Gate. No big deal. Spotted! Actor Joshua Jackson buying a Nedvin Harris Suit (42570): Winter '11 range — at Tiger Of Sweden Sandton City. Cute pic of him in Whistler. Thanks for sharing Nikki-jasmine. Oh boy. Fox just cancelled Steven Spielberg's "Terra Nova". I'm getting nervous. If Reilly's not afraid to cancel something by Steven Spielberg... !! And... another rumor: apparently Joshua Jackson is SINGLE now ( meaning he and Kruger are over , done, split, kaput etc.). That's interesting that you mention him being split from Kruger. I've only really heard people bringing that up recently because she doesn't wear that ring. Which she's been doing for some time now and was still seen with him at events, out and about, etc. Not sure what that all means. Where did you hear the rumors from, Nikki? I have several different sources/reasons to believe this rumor (one of the sources is German). And those reasons have nothing to do with her not wearing a ring, which, like you said, she´s not wearing that often. We should wait and see. If it turns out to be indeed true then I share my info if you want. Right now it´s a rumor. I love it!!! I'm not sure whether I want you to be eating bacon or not?! I second that I'm not sure I want you to eat bacon either! It could go either way for me. I think he would want to start a family, but if she's not ready, he needs to move on. He's mentioned it a few times and they're not getting any younger. IDK, total speculation. But I do feel somewhat more at ease about the "safe bet" declaration, especially since I looked at other shows deemd "safe bet", like 30 Rock and Community. Thanks! It wouldn't surprise me, if in fact they have parted ways. I don't know, I just haven't had a good feeling about them for awhile. Over the past year or so they have hardly seen each other (less than usual). Diane has been taking one movie role after the other, this past year and a half. Though, both have looked happy lately. So, if it's true then maybe it is for the best. Glad to see Fringe changed to a safebet. Hopefully, that means that if season 5 is the last, they will be able to wrap things up and give the show a proper sending off. On the one hand, I'm dancing around like a fool over the thought that Fringe will get a final season to wrap things up, but on the other hand I'm a sad panda to think Josh and Diane might be over. They always seem so happy and in love in their pictures together. I guess I thought they'd be together for the long haul and maybe even get married and have kids eventually. I feel you on both counts, DJNS. I don't know if the rumors are true. I mean I can see how they could be, but yes, a very sad panda indeed. Time will tell. I would just like to see him happy and have a family like he's mentioned before. I don't post very often but I do keep up with what's being discussed and I'm unhealthily interested in Josh's career (at least in my opinion!!). I would really like him to be a bigger star than he is so far and I obsess over whether that's ever going to happen. I just find it frustrating that people don't know who he is - I think it's just a problem I have!!! I confess I loved Pacey. I really like Peter Bishop and I love Fringe and would like it to get a short 5th season for my own benefit but then I think if it finished now it would free Josh up to do other shows and movies. I would love for him to be in a commercially successful or critically appraised movie, or preferably both! If he and Diane have split (and I can totally believe they have as, though sad, the relationship never seemed to be progressing much), again I wonder what does this mean for his career? Did being part of a high-profile couple give him a higher profile than he would otherwise have had? Would she, with her constant film roles, have helped open doors which would have been beneficial to him? The adoring partner he showed himself to be certainly helped his image. I hope he doesn't go back to his loose-living ways on the rebound. I want him to focus on his career! As you can see, I have issues!!!! Please forgive the long post but I don't have anywhere else to share these thoughts, everyone I know thinks I'm mad for my Fringe obsession as it is! I think it was early January this year when they were last seen together, and Josh was still talking quite happily about her in the Ellen interview which was mid-January. It is indeed sad if this is true, because as someone else said, they did look very happy and in love in most of their pictures. And Josh always seemed to glow whenever he talked about her. To be honest though, it wouldn't come as a complete shock if they had decided to call time on their relationship. I have wondered for a while now if they were on the same page regarding the future (ie. kids). If they are not, then yes, perhaps it is time for them to move on. Neither is getting any younger and sometimes there are deal-breakers in relationships which may have nothing to do with love. Whatever the case, obviously I wish the best for Josh, both professionally and personally. Thanks Seersha. I think those were the last pics we've seen of them together and it's March now. I realize they're both extremely busy working, but that's a real drought. Especially since I don't think there was any sign of them at awards season. They at least showed up at after-parties last year. It would be a terrible shame if they broke up -- and somehow I have this nagging feeling it would not have been Josh's idea. Someone, keep a close eye on that left hand of his off the Fringe set.